Reserve appointment now to skip the queue. WANDER COMPASS is a tourist information center supported by the locals who play active roles as TOMODACHI GUIDE. TOMODACHI means "friend" in Japanese. There are various members like workers and university students, but all of them enjoy interacting with people. They possess rich local knowledge and information which makes your trip more memorable. and more transportation and admission tickets are here. Free Planning is available within 30 mins. Exchange your travel voucher you brought in your country for real ticket. You can exchange cash by currency exchange machine. Exchange surplus JPY into electronic money of your home country. Wear our novelties to receive special presents and discounts! 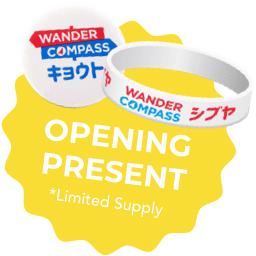 A new tourist hub, Wander Compass Shibuya, is opening on the 19th of October at B1 floor of Shibuya Station. Here our friendly staff will recommend tours and even plan with/for you on your demand.In addition to the tour arrangement service, we provide a baggage storage service, guide service, and more useful services at your convenience.The staff is all locals in Tokyo and knows the popular attractions and local spots you won't have known without visiting here. Visit us at Wander Compass Shibuya. It just makes your trip better. WANDER COMPASS SHIBUYA is located next to Shibuya 109, in the underground passageway near Shibuya Station's exit 3A. User Information to be collected and collection method“User Information” in this Policy means information related to customer identification, a customer’s action history on communication services, and other information related to customers or the customers terminals generated or stored on customers smartphones, personal computers, or other terminals that the Company and/or Huber. Inc. collect pursuant to this Policy. User Information the Company and/or Huber. Inc. will collect through the Services include the following in accordance with the collection method. Other information inputted by the customer on an input form stipulated by the Company and/or Huber. Inc. User Information will be used for the provision of the Services as stipulated in Paragraph (2) of this Article 2, and may also be used for other purposes as stipulated in Paragraph (3) of this Article 2 by the Company and/or Huber. Inc.. Method of requesting discontinuation of useBy performing the prescribed settings for the Services, the customer may request discontinuation of use of all or part of his/her User Information; in such a case, in accordance with the Company’s and/or Huber. Inc.’s stipulations, the Company and/or Huber. Inc. will promptly discontinue such use. Depending on the type of User Information, the collection or use of such information may be a condition to the Services, and in such a case, if and only if the customer cancels the Services in a manner prescribed by the Company and/or Huber. Inc., the Company and/or Huber. Inc. will discontinue such collection. Consent to provision of User Information to third partiesBefore using the Services, a customer must consent to the provision of User Information by the Company and/or Huber. Inc. to third parties as set forth below. If by methods prescribed by the Company and/or Huber. Inc., a Guest Member shall input personal identification information (the customer’s User Information that is necessary to identify a Member designated by the Company and/or Huber. Inc.) and answers to questions about the trip. (User Information that will be provided)The customer’s(Guest’s) name, telephone number, email address or Facebook account, If a Guest Member answered questions about the trip, information of answers to questions about the trip, and other information that the customer(Guest) inputs or Provides etc. on an input form stipulated by the Company and/or Huber. Inc. through the Services use procedures. If a customer(Guest) intends to use the Services and carry out procedures relating to products or services that the Services Provide or contact the Guide Member of such Contents etc., disclosure by the Company and/or Huber. Inc. of the following User Information to persons who Provide etc. such products or services. (User Information that will be provided)The customer’s(Guest’s) name, telephone number, email address or Facebook account, If a Guest Member answered questions about the trip, information of answers to questions about the trip, and other information that the customer(Guest) inputs or Provides etc. on an input form stipulated by the Company and/or Huber. Inc. through the Services use procedures. If the Company and/or Huber. Inc. provide Personal Information to third parties, the Company and/or Huber. Inc. will comply with setting, storing etc. records of the provided date of Personal information, third parties’ name etc. as provided for by the Personal Information Protection Act and rules of the Personal Information Protection Commission. Safety management for protection of personal informationThe Company and/or Huber. Inc. will stipulate rules based on the Personal Information Protection Act to protect personal information it acquires, publicize and emphasize such rules to its employees, and work towards maintaining and enhancing safety management measures necessary to protect the personal information acquired by the Company and/or Huber. Inc..
Disclosure of personal informationIf a customer requests disclosure of personal information pursuant to the stipulations of the Personal Information Protection Act, after confirming that such request is from the customer himself/herself or a legitimate agent (presentation of personal identification documents may be requested), the Company and/or Huber. Inc. will make disclosure to the customer without delay (if the relevant personal information does not exist, the customer will be notified to that effect); provided, however, that the foregoing will not apply in cases where the Company and/or Huber. Inc. are not obligated to make disclosure under the Personal Information Protection Act or other laws and regulations. It should be noted in advance that there will be a fee (500 yen per request) for disclosure of personal information. If (i) on the grounds that personal information is not true, a customer requests correction of the content of such information pursuant to the Personal Information Protection Act, or (ii) on the grounds that personal information is being handled beyond the scope of use purposes announced in advance or that personal information was obtained through deceit or other unauthorized means, a customer requests discontinuation of use of personal information pursuant to the Personal Information Protection Act, or (ⅲ) on the grounds that personal information is provided to third parties in contravention of Restriction on Third Party Provision of the Personal Information Protection Act, a customer requests discontinuation of the provision to third parties, after confirming that the request is from the customer himself/herself, the Company and/or Huber. Inc. will perform the necessary investigation without delay, and on the basis of the findings of such investigation, correct the content of, discontinue the use of personal information or discontinue the provision to third parties, and notify the customer to that effect. If the Company and/or Huber. Inc. decide not to correct, discontinue use or discontinue the provision to third parties based on a valid reason, the customer will be notified to that effect. If a customer requests removal of his/her personal information, and the Company and/or Huber. Inc. determine that it is necessary to comply with such request, after confirming that the request is from the customer himself/herself, the Company and/or Huber. Inc. will remove the personal information, and notify the customer to that effect. If under the Personal Information Protection Act or other laws and regulations, the Company and/or Huber. Inc. are not obligated to carry out correction etc. or discontinuation of use etc., the preceding two paragraphs will not apply. Procedures to amend this PolicyThe Company and/or Huber. Inc. will perform appropriate reviews of the state of operations relating to the handling of User Information, work towards continuous improvement, and may amend this Policy when necessary. If this Policy is amended, customers will be notified by posting on the Company’s and/or Huber. Inc.’s webpage; provided, however, that for amendments that require the consent of customers under laws and regulations, the consent of customers will be obtained by methods prescribed by the Company and/or Huber. Inc..